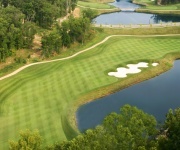 bring your clubs to Branson and enjoy a unique golfing experience, one thats not only fun and challenging, but pays tribute to Missouris best golfers. Instruction Individual and group lessons available. The Branson Hills Golf Club has an amazing and beautiful clubhouse, restaurant, and snack bar. personal life. A glassed display called the Payne Stewart Museum features items loaned by Stewart’s wife, Tracy Stewart, and includes five Ryder Cup bags, apparel, shoes, clubs used for significant wins and other personal items. Tee-Time Policy: Available 30 days in advance via our website or by calling the golf shop direct. Rental Clubs/Shoes Available: Taylor Made, Nike, Titleist and Cobra clubs available.